This page lists all the accepted abstracts for the EUCARA-2016, and the presentations where we’ve received them. Mike Garrett – From the Dwingeloo Telescope to the SKA. Our keynote speaker will sketch out the evolution of radio astronomy from the Dwingeloo Telescope to the Square Kiometre Array (SKA). Advances in technology have driven an exponential increase in the sensitivity of radio telescopes over the last 60 years with more recent developments also greatly expanding the Field of View. He will briefly review the scientific discoveries this has permitted and look forward to the future and the era of an operational SKA. At the public astronomy observatory ‘Midden Nederland’ in Amersfoort a project has started with the goal of receiving the 21cm Hydrogen line using equipment that any public observatory or educational institute can afford. Starting point is the application of the best practical means in a way that is reproducible elsewhere with a low budget. Paul Boven – A new frontend and backend for the D.T. – and for you? The Dwingeloo Radio Telescope, thanks to the contributions of many volunteers, is once again fully operational. It is one of the very few places in the world where visitors can routinely participate in the live observations of pulsars. Most of the radio astronomy is carried out using a custom FPGA based backend, built in 2008. We’ve learned a lot about the capabilities and limitations of our instrument since our first observations. Like any true astronomer, we want to get even more out of our instrument. More sensitivity, stability, RFI suppression, bandwidth, frequency coverage, the list goes on – the only thing we’d like to decrease is the noise figure. With the 60th anniversary of our dish we want to start with the development of a new receiver system. The large number of participants to this conference suggests that there should be ample interest in such a receiver outside of CAMRAS, and it would be great to be able to join forces on this. A collaboration under an open hardware license is one possibility. This presentation will consist of an outline of what such a receiver will look like, and an invitation to join the project. This study seeks to determine the minimum useful antenna aperture for amateur radio astronomers to successfully detect the strongest pulsars using low-cost receivers based on the RTL2832U SDR. Proof of the evaluation relied on the collaboration with amateurs who had access to 25m+ radio telescopes and could provide raw RTL SDR data of pulsars. Software was developed to process this data using spectrum analysis, synchronous folding and de-dispersion algorithms to optimise the pulsar signal-to-noise ratio. This SNR data enables calculation of the minimum useful dish size necessary for some effective amateur work. Pulsar data from Vela (G Gancio) and B0329 (M Klaassen) was used in the study which showed that amateur detection should be possible with dish sizes exceeding 3m at frequencies around 400MHz, coupled with careful system design and moderately long observation times. Wolfgang Herrmann – Pulsar Observations with the Astropeiler Stockert Telescope. The talk will present the latest results of observations at 1400 MHz. Up to now, a total of 95 pulsars have been observed with the 25m dish. These include millisecond pulsars and binary systems. Some of the highlights of the observations will be dealt with in more detail, such as mode changing pulsars, nulling pulsars, scintillation phenomena and giant pulse observations. Presented is an on going project which started in 2008. A 9.3 meter obsolete satellite dish was acquired, originally made by the Andrew company. Under contract, the dish was disassembled in mid winter time, mainly as a one man job. Two 6 meter sea containers were needed to move all the metal work, 2200km to Portugal where the reconstruction began. After some years of unavoidable paperwork and time out, a new concrete foundation was designed and constructed, so the telescope could rotate 360 degrees. Now reconstruction began. Because there is no 380 power grid, the elevation motor is not strong enough to move the dish up from 0 degrees. So, the ‘first light’ measurements were done on the milky way in a drift scan. Counter weights were made and the telescope elevation can now move from 90 degrees down to 60 degrees. The first real first light measurement was done on NML Cygni and the result presented and interpreted. Activity plans for 2016 are presented. Antenna pedestals and parabolic reflectors saved from the scrapyard, a modest budget, a lot of work in spare time and luckily access to expert advice … A recipe to build an interferometer. Step by step testing and calibration showing fringes on ever weaker radio sources. The work is far from finished but so far very encouraging. Harm Munk – Mapping the Milky Way Galaxy, Again. Historical observations have large educational value. In this presentation, we will show how redoing the observations with the Dwingeloo radio telescope that led to the first map of the spiral structure of the Milky Way, can actively involve students and high school pupils in radio astronomy. In just one weekend. Experiments with radio equipment at low and very low frequencies to observe the Northern Lights. Gerhard Stramm – A self-made 21cm feed for less than 20 Euro. A step by step description of how to build an 21cm feed. Pure mechanics. Woodworking, tin tailoring and plumbing. Hugo van Woerden – The Dwingeloo Radio Telescope: History and Achievements. 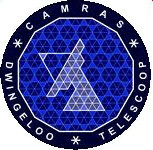 The 25-meter radio telescope at Dwingeloo was inaugurated on 17 April 1956, after twelve years of preparation. Over a period of almost fifty years, it has made major contributions to interstellar, Galactic and extra-galactic research, and it has laid the basis for further development of radio astronomy in our country. After careful maintenance and upgrades by CAMRAS, the telescope has been renovated as a scientific and industrial monument, and is now serving both amateur astronomical projects and high-school education.